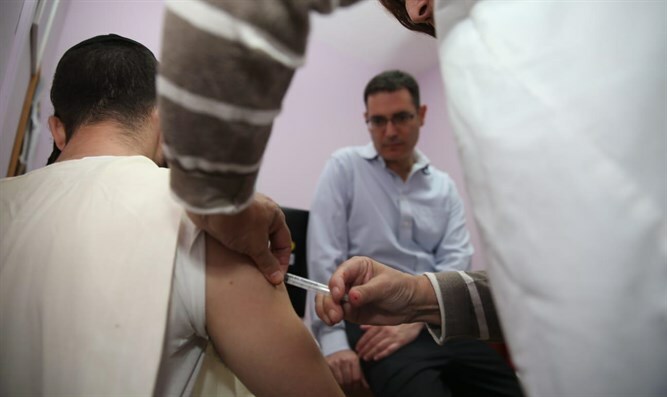 Interest in the measles vaccine has risen sharply in Israel, according to a recent study. Health Ministry Director General Moshe Bar Siman Tov met with Jerusalem district physician Dr. Chen Zamir and the directors of public health services at the ministry, overseeing the field of immunization. According to the data, there has been a dramatic increase in recent weeks in the number of measles vaccines received by the general population in several neighborhoods in Jerusalem. Deputy Health Minister Yaakov Litzman expressed cautious optimism, but asked the population to continue to be vaccinated. "There is an increase in the number of vaccines available, and this is the result of intensive work by all the bodies in the health system, but measles is still not behind us," Litzman said. Moshe Bar-Siman Tov, Director-General of the Ministry of Health, said, "We are concentrating a huge effort on measles and the system is taking over the event, although we are still more likely to see an increase in the number of people infected. Led by our medical teams, especially the professional nursing teams and the traditions, we succeeded in raising the immunization coverage." "We have succeeded in bringing Jerusalem very close to the national coverage rate of vaccinations, which is a tremendous achievement due to the nurses' commitment. The public health system and the Israeli people should be deeply grateful to those nurses who have done long shifts of vaccination hours into the night of the outbreak, And leadership discovery," added Bar-Siman Tov. The Health Ministry reported recently that the number of those in infected with measles in Israel is approaching 900 individuals. Around 60% of those infected are residents of Jerusalem from the hareidi sector, many of which are not vaccinated. Last week, an 18-month-old toddler died after contracting measles in Jerusalem. A recent outbreak of measles among religious Jewish communities in New York as been linked to people who were exposed to the virus while visiting Israel.